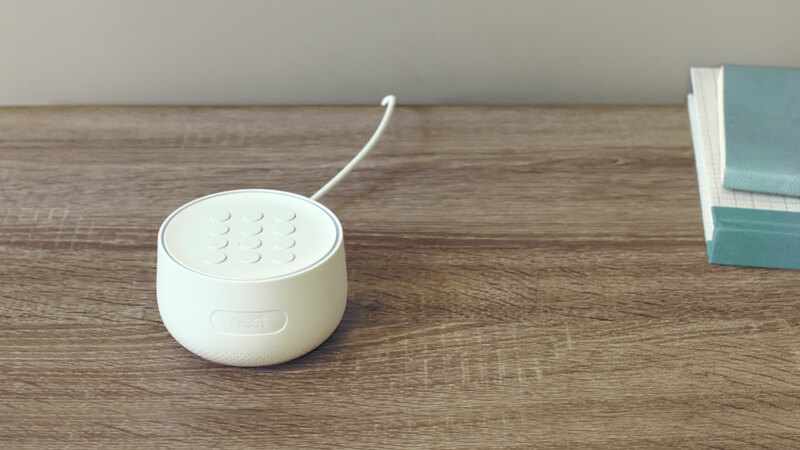 Introducing the Nest Secure alarm system. Nest Secure comes with Nest Guard, two Nest Detects and two Nest Tags. Add to your system. Get an extra layer of security with professional monitoring. Alarm, keypad, and motion sensor with Google Assistant built in. The sensor that looks out for doors, windows and rooms. Know what’s happening at home from anywhere. Easy ways to arm and disarm. You can choose how much time you need to arm or disarm before the alarm goes off – up to 5 minutes. For doors you use most, you might give yourself more time. For doors you hardly use, you can set No Delay so the alarm goes off instantly when it opens. And if you forget to arm, you’ll get a Remind Me alert on your phone. Give Nest Tag to family or people you trust. Set a schedule to let someone in at certain times, like your dog walker. And don’t worry if you lose one. You can easily disable it in the Nest app. Stick Nest Detect on a window, and you’ll know when it opens. Stick it on a wall, and it senses motion in a room. And when you stick it on a door, it can sense both motion and open/close. You can turn motion detection on and off in the Nest app. Nest Detect looks out for your family, whether you’re home or away. When your kids run out the door to the backyard, you’ll hear an open tone. When you need to leave early and the house is armed, Quiet Open keeps the alarm silent while you open the door. Pathlight helps you find your way in the dark. And Dog Pass keeps your small pooch from setting off the alarm. Always know what’s happening at home. If the alarm goes off, you’ll get a security alert on your phone.2 Check the free Nest app to see what triggered the alarm – either a door or window opened or someone entered a room. Then you can call the police or your emergency contacts. Nest Cam spots them red-handed. Outdoor Nest Cams can deter intruders from even breaking in. And if they do, indoor Nest Cams spot them in the act. With a Nest Aware subscription, you can even make a video clip to send to the police. You can do it yourself with the Nest app. If you need help, a Nest Pro is ready and waiting. It’s UL-certified and includes battery backup. So if your power goes out, it stays up and running. Cellular backup, just in case. Delightful user experience, where we don't have to use the system. It automatically takes care of the security. Best feature is reminder when you go out of your house, it asks you to arm the system. Nest secure was extremely easy to set up. Nest secure works perfectly and as advertised. The system is expandable as far as ID tags and motion/door sensors. You can easily customize the system to fit your needs and budget. Extremely reliable, even remind you to set the alarm if you forget to and it senses that no one is home. Highly recommend. Someone’s always got your back. Look out for more doors, rooms and windows in your home. Mobile notifications, video streaming and video recording require working internet and Wi-Fi (or cellular backup, sold separately). Cellular backup may not be available in all areas. Pricing and availability subject to change. Does not include monitoring or agent response for Nest Protect smoke and CO alarms.